Today: Cathy Barrow (a.k.a. 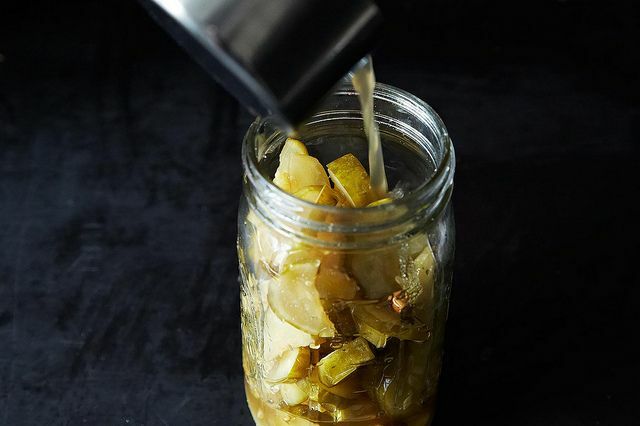 MrsWheelbarrow) shares a recipe for 7-day pickles that have brought together a community of pickle-lovers. 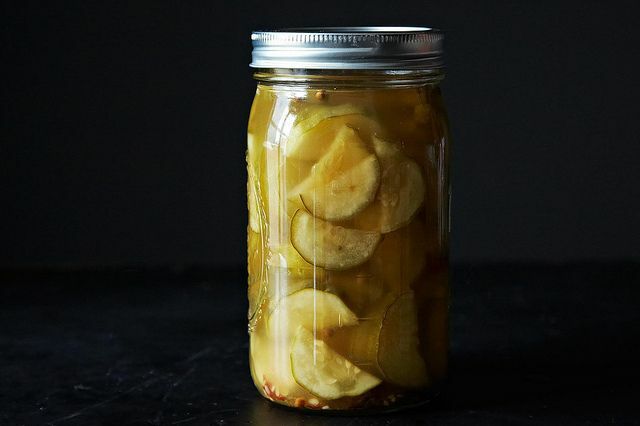 For years now, I’ve made a sweet, tangy pickle I named for my Grandmother’s housekeeper, Luvey, who brought us an ice cold jar or two every summer. Lunches of hard boiled eggs and sweet pickles were a favorite after gardening or running through the sprinkler. 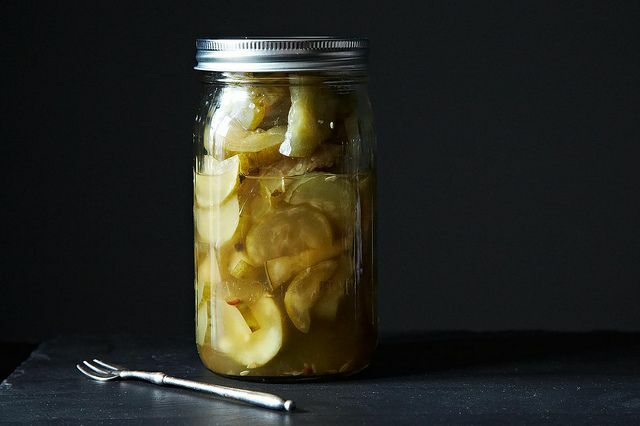 Those pickles haunted me for years and it wasn’t until I discovered a note in my grandmother’s recipe cards detailing a technique more than a recipe -- a seven day process -- that I tasted them again. 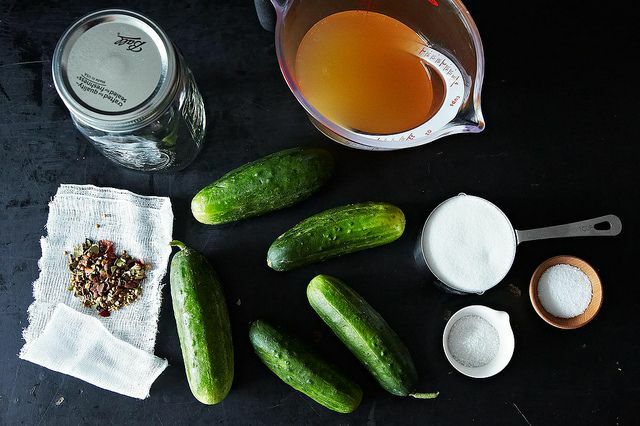 Ten pounds of cucumbers transform into, well, a boatload of pickles. The first year I made half a recipe. Since then, I’ve made the whole ten pounds. They’re that good. Two years ago, in New York to visit the Food52 offices, I wandered through Union Square Greenmarket. Imagine my surprise when I spied Seven Day Pickles on the table of a Mennonite farmer. That was a slap in the face, I’m telling you. And so I researched widely, even reviewing recipes in the Mennonite Cookbook (a gem, by the way). Lo and behold, there is a long tradition of Seven Day Sweets. Consider me humbled. So, fast forward a few months and Food52er Emily Nunn came to visit. We got to talking about my seven day pickles, and Emily said her cousin Martha had a fourteen-day pickle that seemed very similar. And so it goes. In the four years since I posted my first recipe, Food52 has become so much more than a collection of recipes. Before Food52, I had no friends who cooked the way I did, who obsessed over recipes, who carried home odd foods from international grocery stores. Until I met you all here, I had no place to share my passion. 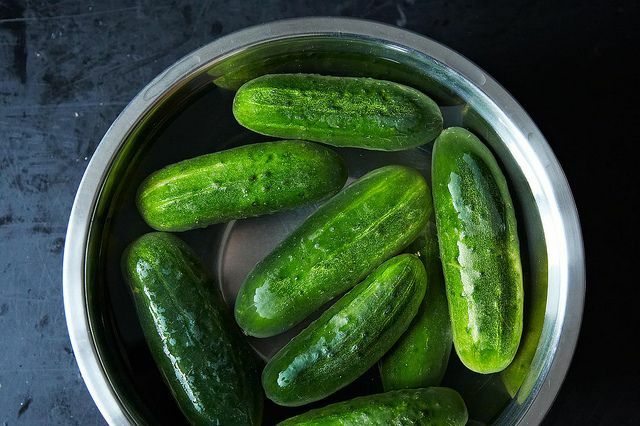 This pickle tale is just a metaphor for the extraordinary way Food52 has changed my life for the better. I know I am not alone. Emily shared Cousin Martha’s recipe and the great pickle experiment began. Two recipes, similar ingredients, dissimilar curing times and technique, all culminating in a taste test with Food52 roots. 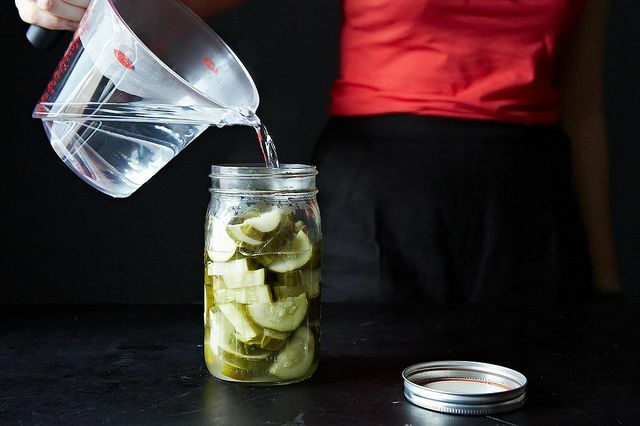 Who better to be the arbiter of brine than Jenny and her daughter, previously known as the Incipient Pescaterian, now a full-fledged Pickle Fan? We allowed PF to make the call. Unwilling to name a winner, she declared both great pickles with two unique pickle experiences: the seven-day pickle was more assertive and vinegary, while the fourteen day was crisper and much sweeter. Day One: Soak the cucumbers in ice cold water for 30 minutes. Drain the water and scrub the cucumbers well to dislodge any remaining dirt. Slice a small amount off each end of the cucumber, then slice into half-inch slices. A mandolin is useful, but not necessary. Pack the slices into a half gallon jar or two quart jars. Cover with boiling water. Cover the jar and let it sit overnight on the counter. Day Two: Drain the water away. Do not rinse. Dissolve the salt in one quart of boiling water. Pour the salted water over the cucumber slices while still warm. Cover and let it sit out overnight. Day Three: Drain the water away. Do not rinse. Add the alum to one quart of boiling water. 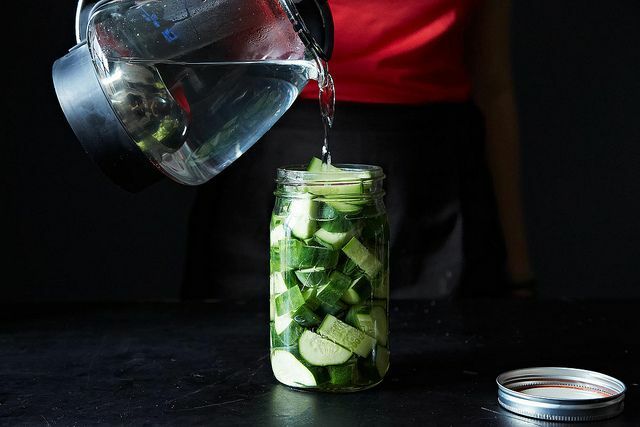 Pour the alum water over the cucumber slices while still warm. Day Four: Drain the water away. Bring the cider vinegar to a boil. Tuck the pickling spice sachet into the jar with the pickles and pour the warm vinegar over the pickles. Cover and let the pickles brine for three days. Day Five and Six. Gaze longingly at your pickles to be. Day Seven. Drain the pickles, reserving 1/2 cup of the vinegar. Dispose of the spices. Place the pickles in a large bowl and sprinkle the sugar over the pickles and add back the vinegar. Cover and set aside for one hour. 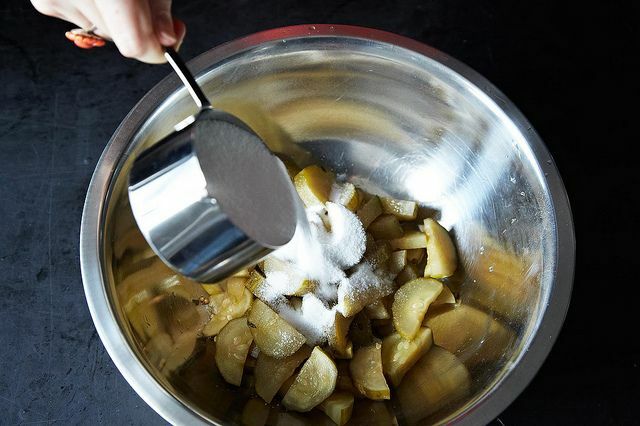 Pack the pickles into pint jars and scrape all the sugar and syrup over them. Cap the jars and set aside. Turn the jars over every day for a few days, as the sugar draws liquid out of the pickles to make a syrup, then store in the cupboard. There is no need to process them in a boiling water bath. Chill the pickles well before serving. My new book, PIE SQUARED. Irresistibly Easy Sweet & Savory Slab Pies is available for preorder and on shelves October, 2018. Instead of alum you are suggesting four to five black tea bags in one quart boiling water, correct? How long do you steep the tea before adding to the jars? (I assume the tea bags do not go in the jars.). Please describe this alternate process in more detail. I am also concerned about using alum. Thank you! Can't wait to try! Cucumbers should be coming in by end of month. Started these yesterday. I don't have alum handy (and I don't want to get into a discussion about whether to use it or not) and I will need to use black tea or bay leaves. Any guidance on how much of those items I should use? I tested the recipe with many different crisping agents for my book. Use four or five black tea bags (I used Lipton's). I've never heard of using bay leaves for this purpose! Ah, well, I used 2 tea bags based on something I found on another site. We'll see how this comes out. I too would not use alum. Though small quantities are "tolerated," why risk it? 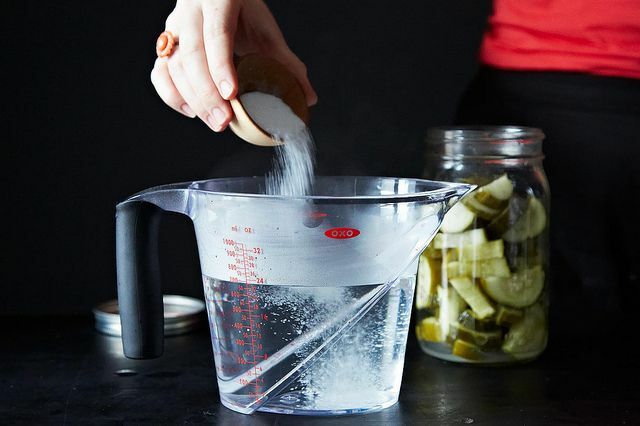 There is a much healthier way to make pickles than adding alum (hydrated potassium aluminum sulfate). I would rather not ingest aluminum. I make my pickles in a Japanese pickle press and use only salt to make them. It takes less than an hour. I pour off the brine, rinse with fresh water, add a little vinegar optional spices and refrigerate. Ridding the cucumbers of excess water is the secret to making them crispy. This is a very different type of pickle. I love a good lacto fermented pickle, but these are brined with vinegar instead. If alum worries you, try black tea leaves, grape leaves or oak leaves instead. Thanks for the tip on grape and oak leaves. I believe fig leaves work well also from our fig tree. Black tea leaves I don't use because of the oxalic acid. Calcium binds to oxalic acid and can cause kidney stones. Lacto fermented pickles are great but enough salt needs to be added to make them crispy otherwise they come out soft with no snap or crunch. For me, it works best to salt and press the cucumbers to remove the excess water making them much more crunchy. I then rinse well with fresh water, put them in jar with vinegar. water and spices and refrigerate. They don't last long enough to ferment them on the counter. LOL I save that for other shredded veggies using a jar with an airlock. Keeping out the air as much as possible ensure that the good cultures take over not allowing the bad cultures to become prolific. I make my own kefir and yogurt as well so we get plenty of probiotics. By the way, kefir has about three times the probiotics of yogurt and is easier to make for those interested. No heat or special appliance is needed for kefir. Oh good. Thanks for your quick reply!! Looking forward to these pickles. 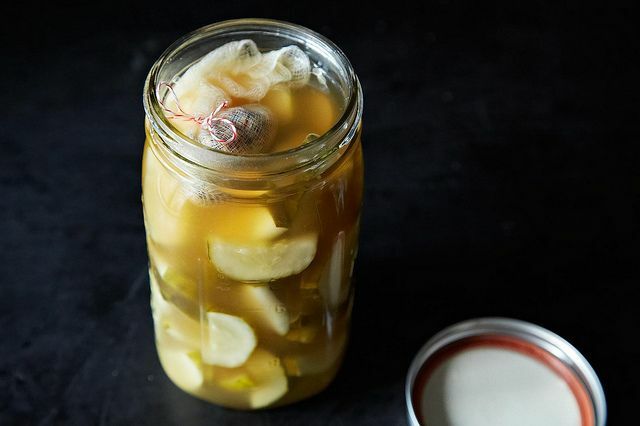 I had some yellow squash pickles the other day and they were delicious; ever make those? Does it take awhile for the pickles to get real sweet? I'm on day 7 & just packed them in my jars; I had a taste of course, they were real tart. They will sweeten and mellow over the next week or so, but if they aren't sweet enough for you, unpack the jars and add another 1/2-1 cup of sugar, then repack. I'm not sure if what i planted are kirby cucumbers, nor not. I know i have some pickling cucumbers. Do you think they would turn out if i use another type of cucumber? Also is there a link for the sour pickles? The link to the NYTimes in a previous comment is not valid. Thank you. If I am using two quart sized jars, do I double the amounts of... salt, alum, pickling spice, etc? and water? The recipe is scaled for two quarts or one half gallon, so the amounts of alum, salt, etc are all appropriate as written. Have fun and enjoy the pickles! No, they aren't refrigerated at any time during the process! After the first day the water was cloudy and had a slimy little slick on top. Is this ok? I'm at day two and the pickles are floating. Will they sink? I'm worried about the few on top exposed to air. Yes, it gets cloudy - that's fermentation! Don't forget, the liquid is replaced every day. If pickles are floating, place a plate, saucer, bowl or whatever on top to force the floating ones under the liquid. Thanks! I can't wait until they are ready to eat. This is my first attempt a pickles. Made these this week and they are amazing! My husband and I both love them. Yay! Welcome to the forever club. Mrs Wheelbarrow, My pickles looks a lot like the picture shown on this page. I think the pickling spices (cloves, allspice) and the black tea leaves may impart a little color, but it isn't noticeable. Hello, this looks like the perfect recipe for me. Wondering if I can quarter slice(like spears)instead of medallions? Hi Cindy, this recipe is geared for chunky slices, not spears. I can't promise the same results if you change the shape. Also, I used black tea leaves in place of alum to keep the pickles crispy, and it worked beautifully. They contain tannin. Stacy, that's a very cool idea. Did the tea leaves dye the pickles a darker color? Will the lacto bacteria be alive throughout this process? I love sweet pickles and healthy gut flora both! Cucumbers and cabbage both have the wild cultures that help with the lacto- fermentation. Also, if you like them with a snap use more salt. This makes them a lot crispier. Vinegar fights the action of the salt. One is acidic and the other alkaline. More salt=crispier pickle. Personally I avoid foods with sugar and excess carbs. By the way. I don't care about the myth, it cannot be healthy to ingest aluminum on purpose, there is enough in food and the environment for the body to rid itself of. "Oral exposure to aluminum is usually not harmful. Some studies show that people exposed to high levels of aluminum may develop Alzheimer’s disease, but other studies have not found this to be true. We do not know for certain that aluminum causes Alzheimer’s disease. Although aluminum-containing over the counter oral products are considered safe in healthy individuals at recommended doses, some adverse effects have been observed following long-term use in some individuals." I am at day 7 and the sweet pickles are now divided into 4 pint jars. Question: they are less than half full with liquid. I will turn them for the next few days, but is this correct? I'm wondering how they'll keep if half are in the liquid and half not. I've saved ll the vinegar/spice solution from days 4 to 7 so please let me know if I should add some to my pints. Thanks! Hi Richard, The syrup continues to form over the next few days as the sugar pulls from the pickles. If it is very low, make a simple syrup of equal parts of the vinegar solution and sugar, boil it for a few minutes and top off the jars. But were yours completely covered when you first put them in pints? With only 1/2 cup of vinegar reserved mine are not full. Or perhaps I was supposed to use all of the vinegar EXCEPT for 1/2 cup? Yes, they should be completely covered. Did you let them sit for awhile before packing the jars? Yes, I let them sit for an hour after sprinkling 1 cup sugar and adding back 1/2 cup vinegar solution. That's the right amount of vinegar, right? If so, I'll give it a few days and see how much liquid is drawn out of the pickles. We should all be asleep! I followed recipe exactly and had same problem. I let them sit for a week and finally boiled more sugar/vinegar and poured over to cover. 1/2 cup liquid for four pints just seems so little! Emily -- I ended up doing the same and the pickles have been a big hit -- about to run out. Still not sure about the liquid quantity but it was easily fixable. So interesting you've had this issue... I never have. I don't know if I pack them tighter? Or actually leave more liquid on them? HMM I have to make another batch to see. More tightly packed -- I think that's it! I just reviewed the recipe and think I found my error. Since the pickles were in a half gallon jar for their seven-day journey, I had it in my head to spread them across four pint jars. But I just noticed that you indicate a yield of only three pints. That probably explains my shortage of liquid to cover. I saved all the liquid on day 7 so I imagine mine tasted the same -- delicious -- but have just had more room to swim around. Mystery solved, I think. Alum is shorthand for potassium aluminum sulfate, and although it is a natural mineral, so are mercury and plutonium. Just say "NO!" to aluminum consumption in all forms, and maybe you'll dodge Alzheimer's disease, too, since aluminum buildup is found in the brain plaques of Alzheimer's victims. Cause, or effect? Do YOU want to find out the hard way?! I don't! It is true that Aluminum was once thought to be a possible suspect in Alzheimer's disease, but abundant research has since indicated otherwise. Nonetheless, you can use black tea leaves to replace the alum if you prefer. Thanks for this recipe as we have had a bumper crop of cukes this year. I had a question however exactly what 'cover' the jar means. Loosely cover? Tightly cover? Seal? I tightly covered the first day but when I opened the jar it nearly exploded in my face. For the following days (I am on day 4 today), I have used a jar without the rubber ring so that the pressure doesn't build up. They seem to be processing OK but when I drain them, they don't smell very good. Is this normal? Will the smell change when I add the vinegar today? I hope that I don't have to throw the whole batch away seeing as I did make 10 pounds. I just don't want to make something that could be potentially toxic and/or dangerous. Please clarify on what exactly is meant by 'cover the jar'. Hi Kate, they do smell funky and fermented until the vinegar goes in the jar. That first day the pickles really ferment and can build up some gases. I have always covered the jar with a tight cover that clamps on. There is nothing toxic there. You've got a big batch of fermented pickles that are going to be delicious in a few more days. Kate, I think you could cover it with a cloth, cheesecloth or a cap, it will not make a difference in the end product. Keeping the gases in or letting them go will make no difference. These are very forgiving pickles (as long as you remove the blossom end of the cucumber. And for me, it's plenty of salt, but doesn't make a salty pickle, it's just enough to aid the lacto fermentation that starts the process. They definitely don't taste salty when they are done, they taste very sweet.